You need to become aware of these criteria before you involve yourself in a legal battle over your fall at work. Believe it or not, the World Health Organization reported that falls are the second leading cause of accidental death in the world. In the United States, 556,000 falls occurred in the year 2013. If you’ve fallen recently then, you’re not the only one. Many of these falls go unreported and because people don’t know their legal rights when it comes to workers’ compensation cases. Don’t be one of the many people who wait too long to take action. Lawyers for slip trip and fall accidents can help you to make a winning case to seek compensate for your medical costs, as well as for the psychological effects of pain and suffering. Did the owner fail to warn people about the dangerous condition, whether verbally or with appropriate signage? Was your injury caused by dangerous facility conditions? Would your injury have been prevented, had the owner conducted a regular inspection of safety hazards? Was the owner responsible or the spill, worn or torn spot, or other dangerous/slippery surface underfoot? Could it be shown that the owner of the premises (or their employee responsible) must have known about the danger but did nothing about it? Do you believe that the owner should have been aware of the dangerous surface because a “reasonable” person, had they known, would have taken care of it? As you can see, these accidents bring up the question of negligence. Negligence is when someone does not take care of something that they should have taken care of. 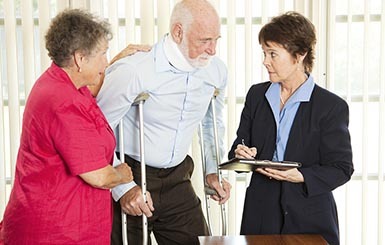 Lawyers for trip slip and fall accidents agree that if negligence cannot be proved, you do not have a case. That being said, it’s easy to point fingers and put the blame somewhere it doesn’t belong. Your own carelessness could have also contributed to the accident, and you should be the one to decide, as best as you can, if comparatively speaking, your responsibility is greater than the owner’s. Did you have a legitimate reason (known by the employer) for being in the dangerous area? Would a careful person have walked by and avoided the dangerous spot, or would it have been impossible to perceive? Were you distracted, running, jumping, or otherwise acting in a way that made the fall more likely? Were there warnings around the dangerous area? Consider these criteria and then ask yourself if you believe you could articulate why the owner is more at fault for your slip trip and fall accidents. If based on these two sets of criteria, you can say (and show evidence) that the owner is liable, then you should contact lawyers for slip trip and fall accidents today. The longer you wait, the less likely you will be able to show it adequately in court of law, and your chances of winning diminish with each passing day. An experienced lawyer at TMH Law knows the in’s and out’s of slip trip and fall law and can ensure the best outcome possible. Contact us today at (215) 543-6771.